266 pounds to 132 pounds – accidentally. Let's explore! It’s Friday! Time for cheers! Whip this deliciously summertime drink and cool out. The weekend has arrived! Thanks to We Like it Raw for the recipe! Using the back of a spoon, mash the mint in the bottom of a pitcher or shaker with the lime juice and agave nectar. Divide between two rocks glasses. Add the sake and ice and stir. Top with champagne and serve with a straw. I am going to keep today’s blog post very, very simple. It is simple only in the sense that actual words will be fewer….but the importance of the words themselves could be life changing. They changed my life. Are you ready? Think about that. Yuck! (You’re welcome). Apologies for the past few missing blog posts! Things appear to be fixed now….. So – lemons. Sour and unforgiving, the flavor attacks the taste buds and overwhelms the melancholy of the tongue to awaken the senses – all of em. Whether you like it or not. That sour cheek blast is going to get you…….but there’s an upside! 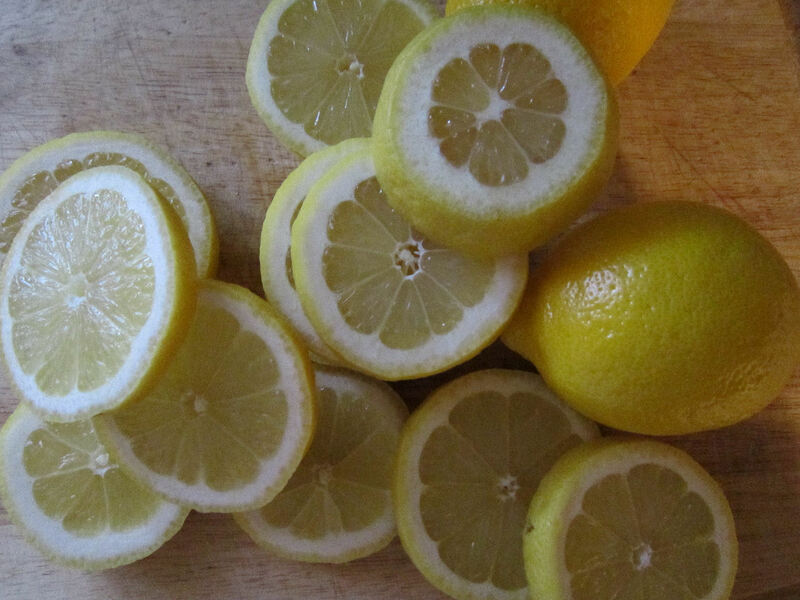 Lemons are beyond excellent for skin, hair and all your internal wonderfulness. I always squeeze fresh lemon juice into my water as it super charges things and allows my body to work the way it should. It is also an excellent way to keep the liver clean and running smoothly. Health benefits of lemon include treatment of throat infections, indigestion, constipation, dental problems, fever, hair care, skin care, internal bleeding, rheumatism, burns, overweight, respiratory disorders, cholera and high blood pressure. Known for its therapeutic property since generations, lemon helps to strengthen your immunity system and cleanses your stomach. It is not only a blood purifier but also enables the body to fight diseases. Lemon juice, especially, has several health benefits associated with it. Useful for treating kidney stones, curing heart strokes and reducing the body temperature, lemonade helps you to stay calm and cool. Read More…. My biggest issue with lemons? Keeping them fresh long enough to use them! I remember being able to keep a lemon around the kitchen for weeks before they would start to feel a little soft. nowadays, i see green mold all over the underside of my lemons within 3-5 days. It is unacceptable! Who do you contact? Someone fill me in….. Someone gave me this incredible suggestion about storing lemons. It is so simple – and it keeps as many lemons fresh as you need – long term! All you do is take your lemons and slice them up. I love the look of a perfectly round lemon slice. They also affix to the edge of a summertime drink wonderfully too! So you slice them all up. Grab yourself a 4L ice cream pail that has been cleaned and dried and layer the slices in the pail. 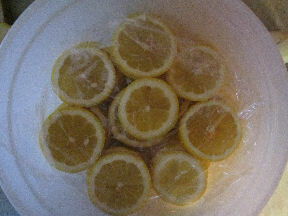 be sure to place a layer of saran wrap, wax paper or freezer paper between each layer of lemons. It prevents them from globbing together. So your pail of lemon now looks like this. Lovingly slap a lid on this and store it in the freezer! I always have lemon in my water, so all I have to do is grab the pail – they’re already sliced up for me! Pitchers of lemonade just became that much easier! The best part of the entire thing? No more moldy, wasted lemons. I’m about to save a lot of money by saving lemons. Where I live, I often pay up to fifty cents per lemon. I recall one visit to the grocery store and they were a dollar each. Remember: It’s not what it costs – it’s what it is worth to you. I imagine that there is a man – and he paves paradise and puts up a parking lot – everywhere. Now, here we are. Thanks, man. I was never one to notice nature. I feigned appreciation of it when my tree hugging buddies would voice opinions on it. I never bothered to really pay attention, I had things to do and people to see! I did dislike the city though – the hot, smelly pavement in the summer reeked of crushed out cigarette butts and melted gum. Cement was everywhere. Nowadays, I think very differently and I am so grateful for that. I received a rare opportunity – the chance to stay home and not only heal myself in a physical sense, but figure a whole bunch of things out in general too! Using nature the way she is meant to be ‘utilized’ is an incredible feeling, and I barely do it justice. I have a garden and a greenhouse filled with seedlings – and the kale – wow! The rest involves a deep appreciation for everything – and I mean everything. OK – maybe not mosquitos! Since I have moved to this home, I have learned about the hazelnuts and wild strawberries that grow near my yard! I also have a wild raspberry patch that has gone unattended for years. I’ve added a watermelon patch, so raspberries would be terrific! There are so many things we are discovering. For example, the other day we wandering down the driveway to the school bus. It had rained and we noticed the driveway was littered with little snails. It was really fun to watch my daughter gingerly pick them up, examine them and explain to me what she saw. Through the eyes of a child! We all need to take time for ourselves – it is crucial. Stress kills people. Exhaustion, worry – fear, it all plays games with our minds and bodies. Get enough rest and eat right – you’ll feel great! We need to spend time with our children instead of saying we should – we need to simply do the things we say we always want to do! Dandelion tea (or wine! ), stinging nettle tea, rosehip tea – we drink them all, and all are picked and dried from areas surrounding our home. It makes me feel cozy all over! These remedies (teas) are not gimmicks, they are medicinally proven cures to various ailments. For example, lemon tea can settle a stomach ache. So can ginger tea. I used to drink garlic tea until a friend mentioned that I should probably slow down on the clove consumption for a while. What can I say? I love garlic! One crushed clove of garlic is equal to 10,000 units of antibiotics…..something like that. Got yourself a cold? Crush 2-3 cloves of garlic and swallow whole. If you can stand to chew it – knock yourself out! Nature is an intricate system – more detailed and finite than anything else. We can upset the balance quite easily and we do. All it takes is a quick internet search to find all of the information you need on harvesting things in nature. My neighbor planted the idea in my head and I’m so glad she did! I’m learning a lot and really having a good time! We added honey suckle to our salad too. Delicious! So get out there and eat the edible stuff, leave the cacti and such alone and you’ll be just fine. Never eat something from nature if you don’t know what it is or what it does. That would be like eating a donut and thinking everything was going to be alright. We know better! 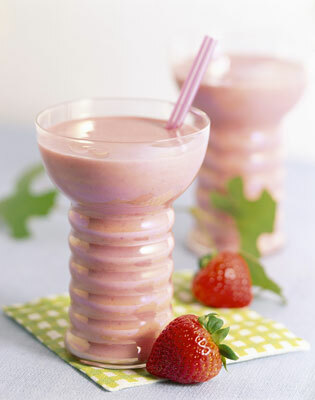 Blend on high until smooth.Add more liquid if the smoothie is too thick. We leave out the yogurt and add more almond milk. Enjoy! I’m convinced women don’t pamper themselves nearly enough! Whenever I mention relaxation or pampering oneself to another woman – they laugh, shrug it off or give me that “Pppffttt – that’ll never happen” speech. I get that type of response every time. We need to pamper ourselves every single day! It is because we deserve it – but also because we need it! Stress is right up there on the scale of what will kill you – so we have to be certain that we are being honest with our levels of stress. If we aren’t being honest and managing stress – we aren’t honoring ourselves. Once our system breaks down from stress, we suffer illness and disease. I was browsing around Raw Food Lifestyles and discovered yet another way we can vamp up our pampering of the Goddess in each of us! So, with skin as today’s featured body part (Woo! Go skin!) – I have discovered some easy recipes to spoil and soothe our largest body organ. 1) Make sure that your face is clean and dry. 2) Mash up all the ingredients in a small bowl and make into a smooth paste. 3) Apply the mixture all over your face, and leave it for 15-20 mins. 4) Rinse off with warm water and gently pat dry. 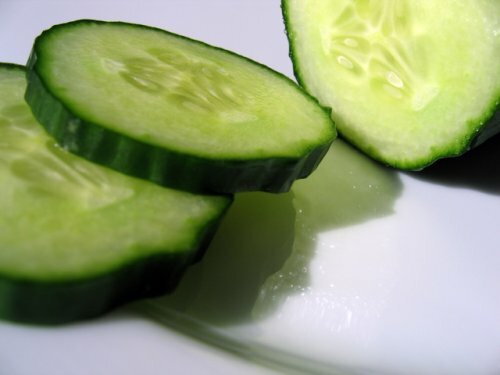 Cucumbers are perfect for calming and soothing agitated skin; they are also excellent for reducing bloating and tightening of skin. 1) After the cleansing and toning masks, gently pat dry your face. 2) Slice up the avocado and scoop out the flesh into a bowl. Mash it up with a fork. 3) If you have normal skin, simply apply the mashed avocado flesh on your face and leave for 20 mins. Then rinse off with warm water and gently pat dry. 4) If you have combination skin, add an egg yolk to the avocado and do the same. 5) If you have mature and aging skin, add a tsp of honey to the avocado and do the same. Avocados are Mother Nature’s Power House – to date, Scientists have yet to fully discover all the phyto-nutrients present in Avocados! These recipes are natural, soothing ways to help your skin become refreshed, revitalized and heal from the adverse effects of every day abuse. I also stumbled onto Pin Up Beauty’s blog – she has some amazing natural skin recipe reviews for things like facial scrub, cleanser, moisturizer and hair oils. I may use some of her tips and tricks currently, but I can’t wait to try the other ideas she has on her site. Oh my! Look at the time! You had better hurry and hit that print button to get these recipes in your arsenal of skin care. Get going – you have some pampering to do! I have actually said out loud, “We bought all this darn squash and now I have to learn how to deal with it.” I didn’t know how to cook squash at all until a little adorable couple in the grocery store helped me learn. By that I mean they actually stood there with me in the squash department and taught me how to deal with my squash. I learned about steaming, baking and spicing it up – right there in the produce section. I love helpful people! I need all the help I can get sometimes! So, in the tradition of keeping it simple, we took our first baby squash steps and created something easy. 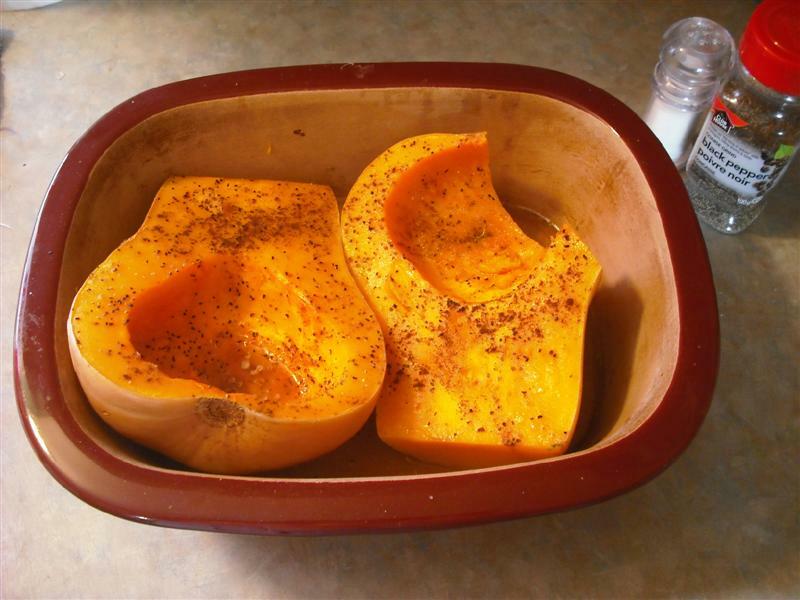 Baked squash. TAA DAAAA!! I know – there is a small section in the top right quadrant missing. Thank hubby – he was the taste tester and tested before the photographer could jump in and snap a photo of the finished product. He’s quick. So, the flavor wasn’t what I expected. I expected bitter….tasteless…this was different (phew!) It was actually edible! We added a touch of coconut oil to the tops – lightly brushed it on and some allspice. The toughest part was cutting this thing open! I was told by the happy produce aisle couple that I should let hubby handle the cutting it open part. I struggled but got it eventually. The colors are vibrant! The flavors are great but definitely something I will take time getting used to. As a former (and recovering) junk food addict, I have to say I definitely will keep making recipes with squash. We just cut it up and dug right in. When it comes to squash we have tonnes to learn – I’m interested to see what sort of dishes go with squash – or how to make it a little more exciting than simply baked squash. I’ll figure it out – it just takes time and patience (and an internet connection). I also have something called a kombocha squash – it is round, green and intimidating looking. I’m going to create another dinner out of that one – perhaps steamed with rice! I also bought a spaghetti squash. I know what to do with that one! We’re going to love squash! Note to summer: Please hurry. I miss watermelon already! Acidity Versus Alkalinity: What is your Ph? MSM – What Is It? Vitamin D3 – Do I Need That? 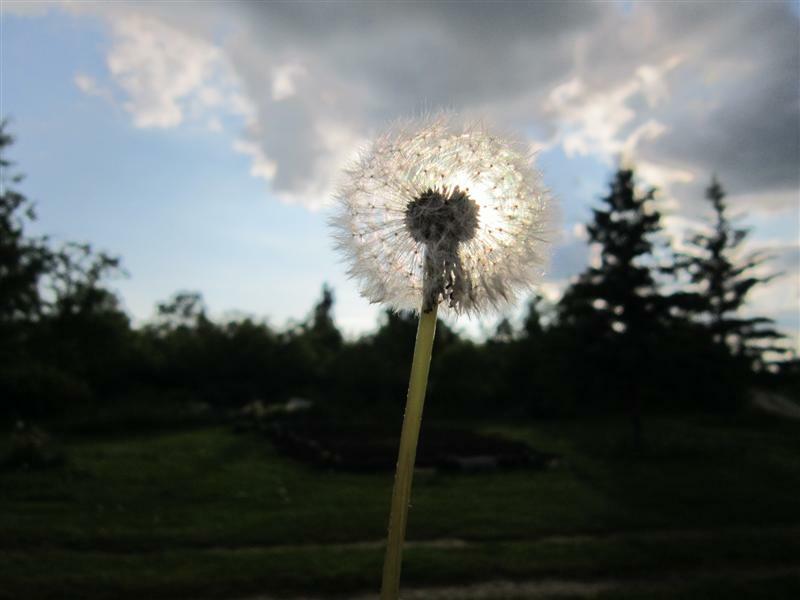 Time Is On My Side….